Roumen Radev took the oath of office as Bulgaria’s president in the National Assembly in Sofia on January 19 2017, with his formal inauguration as head of state scheduled for Sunday. Radev (53) won Bulgaria’s scheduled presidential elections in November 2016 on a ticket backed by the socialist opposition party. The victory of Radev, formerly commander of Bulgaria’s air force before resigning his commission to enter politics, gained him a five-year term of office as head of state. 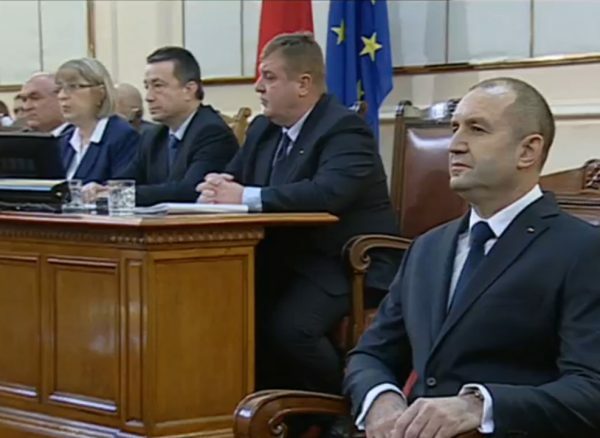 The ceremony in Bulgaria’s Parliament was presided by Speaker Tsetska Tsacheva of Boiko Borissov’s centre-right GERB party – it was Tsacheva’s defeat at the hands of Radev that prompted the resignation of Borissov’s government, precipitating early parliamentary elections expected in late March 2017. The swearing-in of Radev, as well as of vice-president Iliyana Yotova, until now a Bulgarian Socialist Party MEP, was attended by Borissov, members of the outgoing Cabinet, other top state and government officials, diplomats and the head of the Bulgarian Orthodox Church, Patriarch Neofit. Incum bent President Rossen Plevneliev was in the head of state’s seat in the parliamentary gallery. Radev succeeds Rossen Plevneliev, who has served a single five-year term as president following his 2011 election victory on a GERB ticket. Plevneliev decided against seeking in the 2016 elections the second term in office that the Bulgarian constitution allows him. Radev is Bulgaria’s fifth democratically-elected president. Constitutionally, the role is not an executive office, because the government is headed by the prime minister. The president acts as commander-in-chief of the armed forces, has a limited power of veto over legislation, appoints ambassadors on the recommendation of the cabinet, as well as having a share and a role in various other top state appointments.